The technological development and the instant communication possibilities advanced not only economic and social developments, but also evolving threats from those who exploit the vulnerabilities of communication and information systems. The cyber threat landscape points to a significant increase of the frequency, intensity, duration and sophistication of cyber-attacks. One of the new and concerning trends is the use of cyber capabilities in relation with military of hybrid operations – the so-called cyber dimension of hybrid warfare. NATO’s strategy on countering hybrid warfare is based on the triad: prepare-deter-defend, which also applies to cyber. Nations represent the first line of defence in countering hybrid strategies. International cooperation is also a key factor in this sense. It is in this context that NATO’s response to cyber-attacks in the context of hybrid warfare must be further refined. The paper aims to review the new political landscape in Poland, a country that has the potential to be a major game changer within the European Union and the North Atlantic Alliance. When the role model of Eastern European countries and former communists satellites becomes a political surface for a tyranny of the majority, a polarized approach used by Law and Justice Party in order to secure and boost its power, another uncertainty falls in Europe. In its sections, the paper focuses on the political environment that has led to Law and Justice Party’s political win, the vital and undesired threat that quick and rough political measures pose to the rule of law system and the ruling party political view that aims to secure and boost its power in the perils from its proximity, by adopting a double standard policy, one distant from EU’s values and another close to NATO’s core interests. Additionally, the paper examines thoughtfully the double standard issue of Warsaw’s new cabinet in a European Union that hardly copes with different sorts of crisis and an unforeseen security landscape that with a NATO troops deployment in Eastern Europe will establish, if not a new Cold War mind set, at least a frosty view from both Russia and the West. By playing a negative game changer role and choosing to consider a prevalence of self-interests among its European and Euro-Atlantic participation, Poland finds itself in a race that may disrupt democracy for security causes, although they are not mutually excluded. The public perception in Romania regarding the Syrian refugees has dramatically changed within a few months in the sense of rejecting the idea of receiving immigrants on Romanian territory. In August 2015 the polls indicated that Romanians were in favour of accepting the immigrants, while in September 2015 more than half of the respondents declared they were against receiving refugees. What kind of narrative was used by the Romanian politicians to cover the “refugee/migrant crisis”? This study tried to establish the ways in which social media have been changing Romanian perception related to refugees, asylum seekers and migrants. In this research, we have monitored discourses of xenophobia and poisonings that occurred in the Romanian social media. A few Romanian politicians have aggravated the immigrant related debate via their personal social media accounts. The former Romanian President, Traian Băsescu, was one of them. As the EU public debates on whether the refugees’ quotas should be mandatory or volunteer have scaled up, the people’s perception was altered immediately after the discourse about rejecting the refugees has intensified in the online environment. 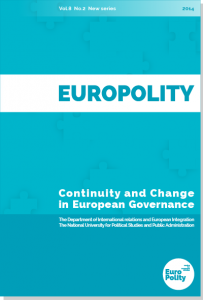 THE SOLIDARITY CLAUSE IN THE EUROPEAN UNION TREATY AS A HUMAN SECURITY VECTOR. A FAREWELL TO TERRORISM OR LEGITIMIZATION OF INFERENCE IN INTERNAL AFFAIRS? The draft European Constitution crafted in the interval between the terrorist attacks of 9/11 in New York and those taken place in Moscow, Madrid, was concluded shortly before the attacks on public transportation in London in 2005, including what is called a solidarity clause (art. 42) and its implementation modalities (art. III-329), however after various vicissitudes, it was never ratified by the Member States and felt into oblivion; while it remained a driving force in the subsequent Lisbon Treaty in force since 2009 as, section 222 in the fifth part under Title VII. Considered by some to be an instrument used by the Russian Federation against the US policies and strategies, the current refugee crisis is a social and political phenomenon, caused by the emergence of the conflicts from North Africa and the Middle East, and has been one of the most important issues of 2015. Although the entire process dates back to 2011, when the Syrian civil war started, its effects and consequences were felt in Europe with the beginning of the last year, when almost 400000 people risked their lives to leave their countries and go to Europe, in search of a safe and secure environment. Due to the fact that EU member states have positioned themselves differently towards this problem, the European Union is now regarded as an international organization that could not handle this kind of issue, failing to provide efficient solutions. The migrant issue has been addressed to at six summits to the date, where the EU leaders tried to find proper measures to adopt, although these proved to be either inadequate or slow. Thus, this paper aims to explain how the refugee crisis has affected the cohesion of the EU, presenting the way the Union has managed the migrant flux. In the end, the 2015 brought one single question concerning this issue: will the refugee crisis cause the break-up of the European Union? Following a study visit in Baku, the author exposes in this paper some of the research results, being also embedded the opinions of Azerbaijanis experts that were interviewed. The aim is to perform an analysis on the evolution of Azerbaijani state interpreted both from the European and Azerbaijani perspective. On the one hand, it is approached the development of the Republic of Azerbaijan after the collapse of Soviet Union and the way the Nagorno-Karabakh unsolved conflict has influenced Azerbaijan’s foreign policy. On the other hand, it is researched the manner in which the European Union – Azerbaijan relations have evolved since 1991, but especially once the Eastern Partnership has been created. Considering the fundamental purpose of the European Neighborhood Union, to ensure security, stability and prosperity in the EU’s vicinity, it is analyzed the impact of two multilateral platforms within the Eastern Partnership (Democracy, good governance and stability, and Energy security) was achieved on the Republic of Azerbaijan. At the same time, it is investigated whether the European Union should accept an authoritarian leadership, as a legitimate actor and partner on the international stage just because the EU has a strategic interest to diversify its energy sources and, eventually, reduce the dependence on Russian Federation, or it should change its approach and adopt a firmer stance. Last but not least, are revealed the geopolitical frictions in the South Caucasus region and the reasons for which Azerbaijan tries to maintain its status as a sovereign and independent country, avoiding to ally with any geopolitical bloc, but opting for economic, energy and military cooperation with both sides.